Some people deserve to be spoiled, so a simple gift of toiletries or flowers may not be what you are looking for. A silver compact mirror engraved with whatever message you hold deeply is a personalised gift that will last. Coated with real silver, it conveys quality, and the special message is the finishing touch that gives it a sense of uniqueness. Personalised gifts are slowly increasing in popularity again. It can therefore be difficult to find exactly the right item to suit the recipient and the occasion amidst all the engraved gifts that are currently on the market. If you are looking for a present for a close person like your mum for Mother?s Day, not just anything will do. 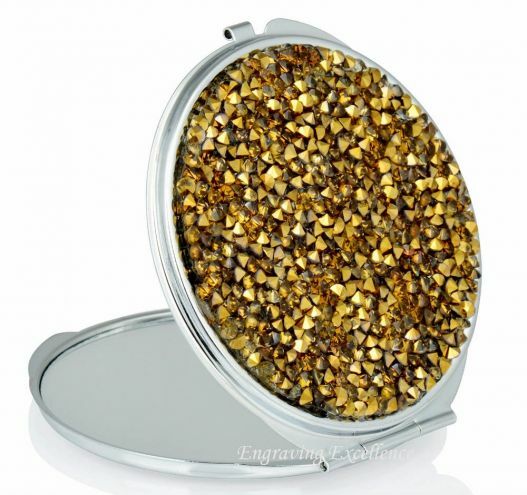 But an engraved compact mirror that has been coated with silver is guaranteed to bring pleasure to the person you love. Silver never goes out of fashion, and with tone with any choice of outfit, making it suitable for everyone. You can either pick a compact mirror that is fully coated, or choose a more simple design, with only the inside or the carvings dotted with silver, depending on personal taste. What?s more, prices tend to begin at the relatively inexpensive, so if you have a strict budget, do not dismay as there?s sure to be an option to suit your pocket. With a practical gift like a compact mirror, silver is a great choice, as it beautifully complements and frames the inner reflective mirror part. Whether you are on a strict budget or have more money to spend, a silver compact mirror engraved with your personalised message is a great choice - it looks and feels luxurious. We at Engraving Excellence are dedicated to help you choose the best gift possible. To view our stock or get some ideas, visit us at http://www.engraving-excellence.co.uk/.